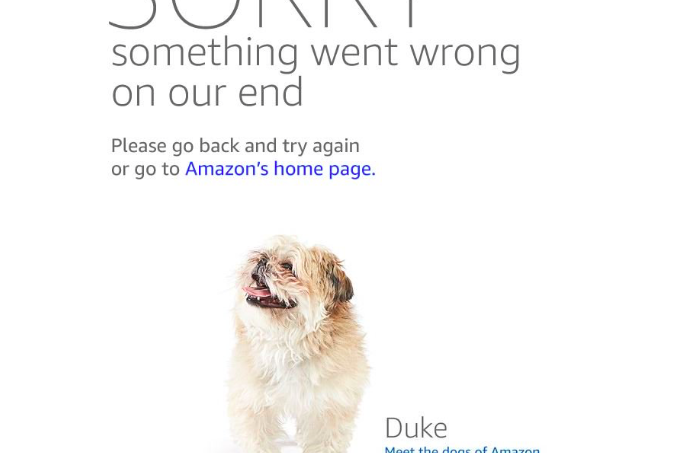 Amazon uses dog photos as error messages on Amazon Prime Day 2018. At 3 p.m. eastern time on Monday, Amazon Prime members had their devices at the ready to snag the best deals the online retailer had to offer. Instead of deals, they got dogs. That's because Amazon's website crashed shortly after 3 p.m, when reports of issues with the site skyrocketed on DownDetector.com. Users on the desktop and mobile sites received error messages displaying various dog breeds. Some discount shoppers decided to make light of the situation by building on the whole dog theme. Others weren't so willing to let Amazon off the hook with the distraction of dogs pictures, taking the opportunity to point out that some of the company's European employees are in the midst of a labor struggle. Don't buy anything from Amazon for #AmazonPrimeDay. Amazon decided to structure this year's Prime Day with a series of "lightning deals," or limited time offers that alternate throughout the course of the day. Given the way things started on Monday afternoon, shoppers may be in better position to strike when the issues are fully resolved. Until then, paying Prime members probably have Amazon in their dog house.